Lt. Gov. 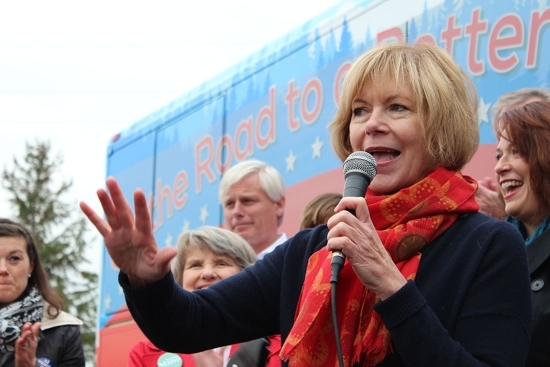 Tina Smith pictured in 2014. Gov. Mark Dayton appointed Smith to the U.S. Senate seat vacated by Sen. Al Franken, who resigned Dec. 7 amid sexual harassment allegations. “An abortion industry insider, Ms. Smith is a former vice president of Planned Parenthood in Minnesota, the state’s leading performer of abortion. The choice of Ms. Smith is particularly egregious to Minnesota’s pro-life citizens, who will have no representation in the Senate,” he said in a Dec. 13 statement. MCCL is based in Minneapolis. LaLonde said that Smith helped to lead Planned Parenthood’s opposition to Women’s Right to Know legislation, which sought to educate women about abortion risks and alternatives. Students for Life of America President Kristan Hawkins also criticized the choice of Smith, a Democrat. The selection “makes clear that the Democrats will be fully embracing abortion as their main issue in upcoming elections,” she said in a Dec. 13 statement. With a marketing background, Smith served as vice president of external affairs for Planned Parenthood of Minnesota, North Dakota and South Dakota from 2003 to 2006 before leaving to serve as then-Minneapolis Mayor R.T. Rybak’s chief of staff. She served as chief of staff for Dayton from 2011 to 2015, and has served as lieutenant governor since 2015. Smith will replace Democrat Sen. Al Franken, who announced Dec. 7 he planned to resign his office due to sexual harassment allegations.